JUST OUTSIDE my kitchen here in Oxford is a surpassing – perhaps egregious Holly Tree. The bounty of fruits has been pretty fab in Englandland this year, and my Holly Bush provided a surfeit of er berries, surpassed by spiky holly things. So this Wood Pigeon has been snaffling the berries for the last two or three weeks – I have no idea what the berries taste like to the daft bird. 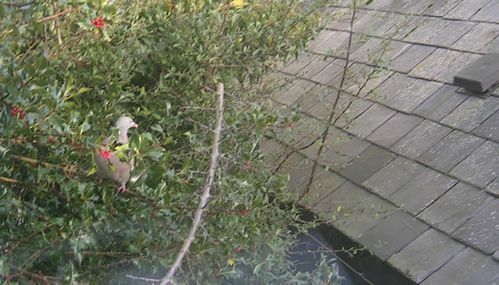 The daft bird has been surfeiting on the Holly Berries just an arm’s length away from certain death if I was as much of a carnivore as I pretend. This entry was posted in Uncategorized and tagged daft birds, egregious, Holly Berries, Holly GoLightly, Holly Tree, Kapota, Oxford, pigeon, wood pigeons. Bookmark the permalink. My cat snaffled a wood pigeon yesterday. Not seen her catch anything before. She later turned up at the back door with what remained of said pigeon, in an attempt to feed her six pesky kittens. The feathery mess ended up in the wheelie bin. The kittens will have to make do with my rice and tinned sardine concoction for the time being. Shall I bring you a moggy Mike? RED Berries Are Usually NEVER Eatable, although NOT Always DEADLY, Sample ONE & Oops, barf, hey whys world spinning, opps, Acreola is RED Berring fungal things like picture. Vitamin C Is Derived from Acreola. C Breaks down Toxins guess. Next is drashek Everywheres’ Mother? Lately seems Mother of Everywhere was Everywhere. If Drasheks Everywheres’ mother, then EveryWhere Is DRASHEK. Hmmm…. think the plant ‘wants’ the berries eaten, so that the pigeons et al can then poo them onto the floor, which in turn creates new berry plants. Perhaps the spikes are there to fend off more dangerous animals that would cause more harm than good to the plant… like the humans ? Lizah: Yeah& berries that can survive such intense digestion & grow are stripped of methly toxins most berries use to create own soil & root illium. Not Only becomeing eatable, moving close to outhouse, for convient snacking. Our woods which surrounds my home are dense with red oak and holly trees. I don’t like the pricklies. Before Placing Potatoes In Hoven, Prick Them Several Times. Washing recommended.